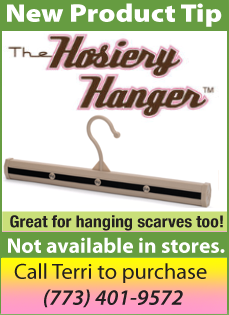 • It’s helpful to standardize your hangers. It doesn&tsquo;t matter what type you prefer, just make them consistent and always hang clothes in the same direction. This will help reduce visual clutter and allow you to review your clothes at a glance. Wooden, padded, plastic tube, or velvet “huggable” hangers, rather than cheap wire ones, will keep your clothing in top-notch shape and avoid tangles. Get rid of extra hangers, which just take up space. See if your dry cleaner can recycle your unneeded wire hangers. • Building closet management into your weekly routine will reduce time and stress in your daily quest for determining what to wear. It will also allow you to make the most of your wardrobe and feel great about getting maximum use out of clothes you already own. This project may seem daunting, but its rewards are many! If you‘re stuck, consider enlisting a trusted friend or professional organizer to help you with the process, especially the clutter-clearing steps. Helping a Busy Working Mom.